Consulate of Lithuania in Istanbul and DEİK (Foreign Economic Relations Board) hosted and organized Turkey-Lithuania Business Forum, in İstanbul Turkey on 9th of December. The Secretary General of International Center for Support and Coordination for Economic Cooperation Mr. Murat Teber and the board member Mrs. Elif Cagla Isik have attended the Business Forum on behalf of International Fund for Cooperation and Partnership of the Black Sea and the Caspian Sea.Business Forum has started with the speeches of President of Lithuania Ms. Dalia Grybauskaite and Mr. Nail Olpak the Vice President of DEİK, Turkey. 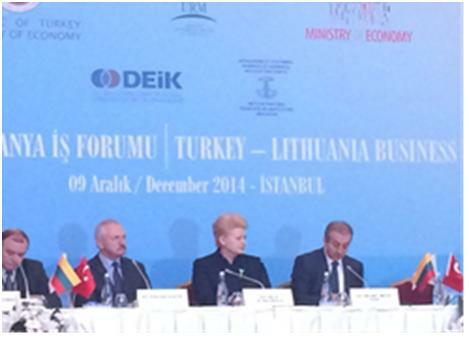 The main subject of the Business Forum was trade relations and new opportunities between Turkey and Lithuania. Presentations regarding, doing business in Lithuania, laser industry in Lithuania, alternate transportation opportunities in Lithuania were presented.After the presentations, bilateral meetings were held. Mr. Murat Teber and Mrs. Elif Çağla Işık had some contacts with representatives of Lithuanian companies elated to the current and possible future projects of the Economic Center.